On the night of 26/27 April we had a surprisingly heavy frost. The next day reports from Bourgueil to Amboise started coming in that the vines had been hit hard. Some vineyards in Bourgeuil have lost their entire crop because the vines will not recover this year from the frost damage just as the vines had burst into leaf, a critical moment in the vineyard cycle. Other particularly badly affected areas include Saint Georges sur Cher, Cravant-les-Coteaux and Montlouis. Lady Orchid (Fr. Orchis pourpre), frosted. The damage was oddly patchy in our orchard. The table grape vines, which were not yet in leaf, have crispy brown leaf buds. My guess is that they will more or less recover and give me a crop, but I could be wrong. To my eyes the fruit trees don't show any significant damage. The cherries are in full flower and some bunches have gone a bit brown, but there's no leaf burning. The apples have only just started to flower and would have only been pink buds when it frosted. They look perfect. The pears had almost finished flowering and don't look damaged. The plums flower too high up so I can't tell how they fared, but they too had almost finished flowering. 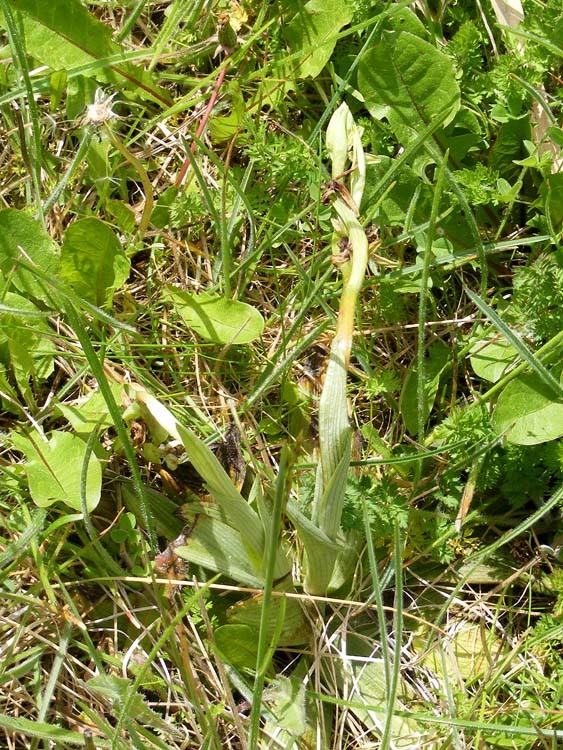 Many of the Early Spider Orchids have been zapped by the frost. 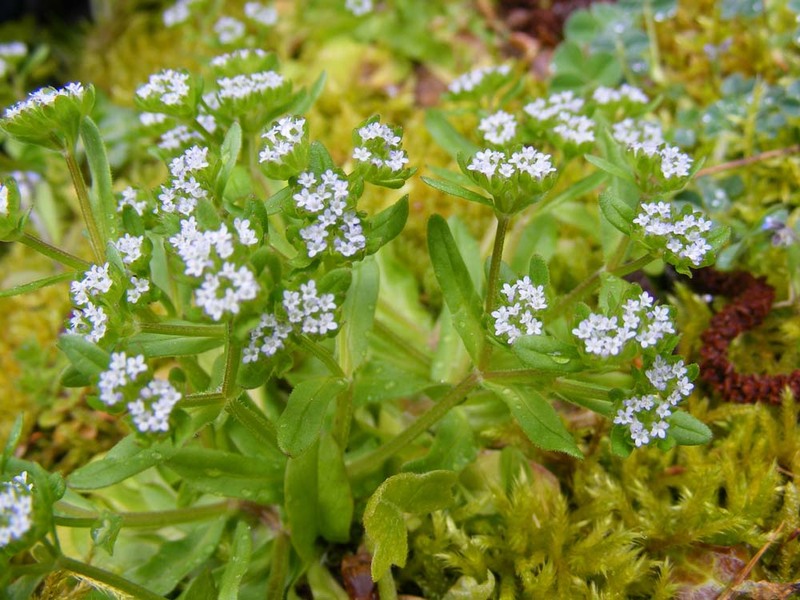 The flowers are brown and shrivelled and the stems limp. The Lady Orchid has equally been knocked. I've never known these two species to be frosted before, so that's an indication of the unlucky timing of the frost and the low temperature (as low as -6°C were reported in some places). Of course, I still have Bee, Lizard and Pyramidal orchids to come in the orchard, as well as a couple of other less abundant species. They are unaffected by this weather. 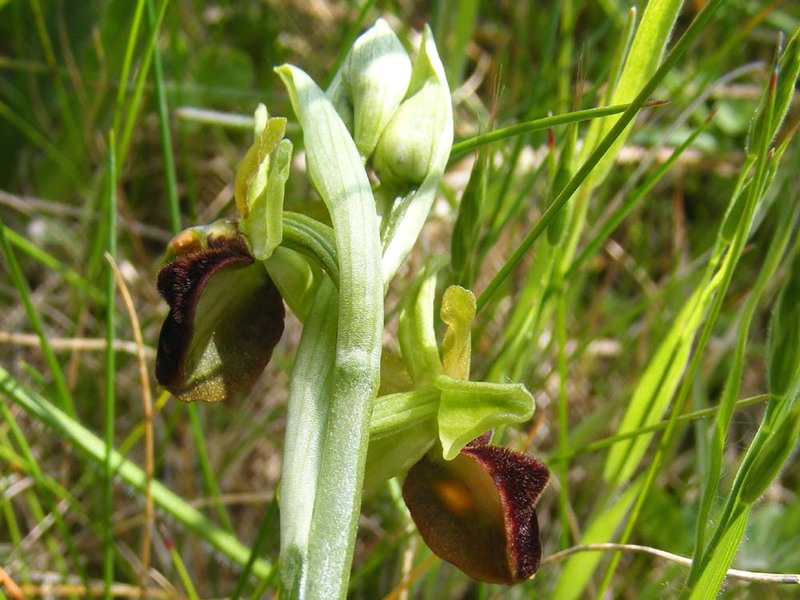 Early Spider Orchid (Fr. Ophrys araignée), frosted. They should look like these, photographed 18 April. The newspaper reports that the last time there was a frost this severe at this time was in 1994 and it may even be as bad as the legendarily bad 1991 frost. Local market gardeners have not been too badly affected by the frost, but they are struggling with the prolonged cold and the slow growth of their produce. The fruit orchardists around Azay-le-Rideau say they won't be able to estimate the damage for another couple of weeks, but they are not too optimistic, since the vineyards around them have been hard hit. Wine producers of course keep an eye on the weather forecast at this time of year, but there aren't many options in the Loire to protect from frost. Late frost that causes real damage is relatively rare, so wine producers are allowed to use things like candles, frost pots and fans, but many don't or can't invest in infrastructure to protect against frost which they are hardly ever going to have to use. It is forbidden in any case to use any sort of fleece protection or sprinklers like they can use in other countries. For more about protection against frost see my post of 15 April 2011, when we saw frost candles in vineyards near Saint Aignan. I've emailed my friend Véronique at Domaine de la Chaise in Saint Georges sur Cher, one of the areas which seems to have been badly affected. I know they had some damage the night of 18 April, but she hasn't got back to me yet about this week's frost. I am fearing the worst. The département announced yesterday they have made available an emergency fund of €200 000 for affected wine producers, although they have not been specific about how this fund will be allocated. The total damage bill is estimated to be at least €100 million (which includes lost revenue on this year's harvest, the impact of which will be felt from next spring when the 2016 vintage is released). Many winemakers are preparing to have their income halved next year. The French Can Make Beer! As a general rule French beer is fairly unimpressive stuff (sometimes even less impressive than Australian beer!) This situation is starting to change (in both countries) with micro-breweries popping up all over and producing some very drinkable brews. But nevertheless, in general, beer in France is dreadful industrial stuff. Saturday was the Fête de la Saint-Georges in Preuilly-sur-Claise. We ran into our friend Gérard at the fair and he asked us if we were having lunch there. He urged us to do so as they were putting on carbonnade flamande (Flemish beef and beer stew), tarte au sucre (sugar tart) and a 'special beer'. So we stayed for lunch, joined by Antoinette and Niall. The 'special beer' turned out to be 3 Monts. I've seen it in the supermarket but never bought it and never drunk it. 3 Monts Flemish beer made by the Brasserie de Saint Sylvestre. The first challenge was opening it. Simon and I had never seen a clip and cork arrangement quite like this but luckily Antoinette misspent part of her youth in the Low Countries and knew how to tackle it. The beer was bright golden in colour, with an enormous head. It was a very enjoyable quaff and went perfectly with the beef stew. Later when I got home I looked the brewery up and it turned out to be a very interesting story. 3 Monts is a bière de garde ('keeping beer'). 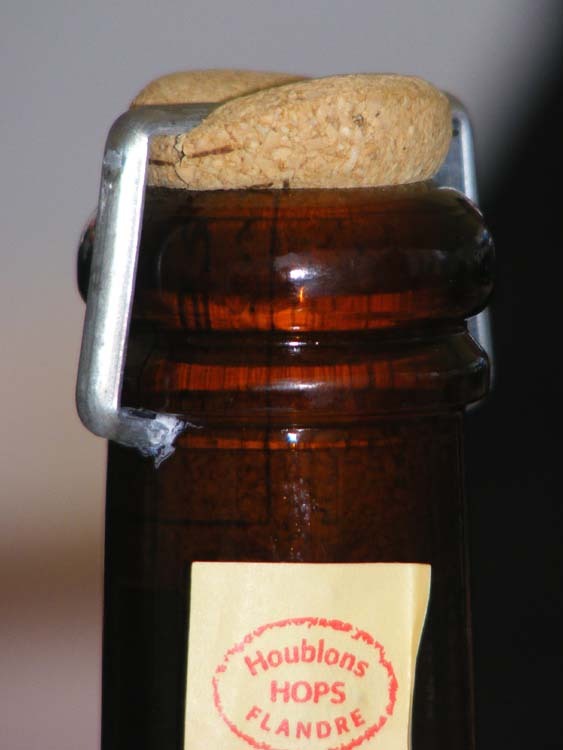 The term used in English for this type of beer is 'pale ale'. 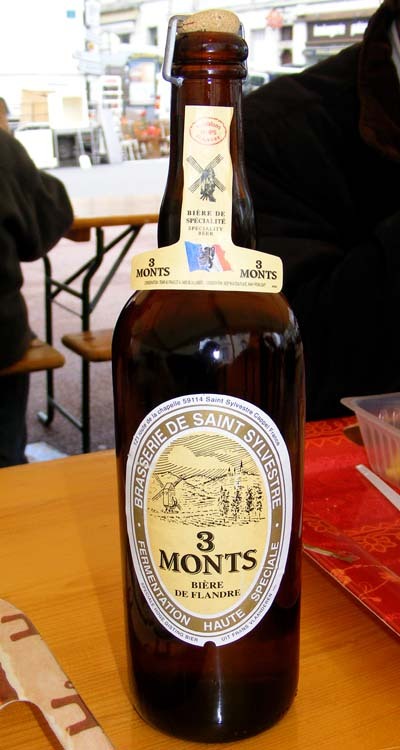 3 Monts is a typical example of this type of beer, produced by the Brasserie de Saint-Sylvestre, a small family owned brewery in Nord-Pas de Calais, the French part of Flanders. The name 3 Monts refers to the three mountains, equidistant from the brewery. These three mountains were too steep for beer to be delivered by horsedrawn dray and the mountain villages had to wait until after the Second World War for regular supplies to be delivered by truck. The challenging but apparently traditional cork arrangement. There has been a brewery in the town of Saint-Sylvestre Cappel since at least 1600. Generally speaking the brewery workers are locals born and bred, and the ingredients such as the hops and barley malt local too. The population is around 1100 and the town also has an ice-cream factory and apple orchards. The hillside site has natural springs yielding potable water and there are still two breweries located in the town, even after the decline in the trade in the 20th century. At the beginning of the 20th century there were 2000 breweries in French Flanders, but today only 30 remain. In September 1939 the owner of the brewery, who was the grandfather of the current owners, was drafted into the army, along with five of his employees. His sixteen year old son stepped into his shoes and ran the brewery for the duration of the war along with the remaining eight employees. After the war the young man decided to formalise his training by going to 'brewing school' and it is largely due to his modernising of the brewery that it survives today. Since 1985 his two sons, also trained brewers, have run the brewery, and it is them who launched the 3 Monts beer. Its popularity has grown from Flanders, then France and now it is sold all over the world, including Europe, the USA, Canada and Australia. For those of you interested in the nerdier aspects of beer tasting, here is the link to the reviews on Beer Advocate. Basically, everyone loves this beer. A la cuisine hier: Avocado mashed with lime juice, salt , pepper and cumin spread on Laurence's sourdough multigrain, with lettuce and wafer thin slices of radish. Rump steak marinated in balsamic vinegar, olive oil, crushed garlic, salt and finely chopped rosemary then cooked at thermonuclear in a cast iron pan. Sliced and served over dressed lettuce and cherry tomatoes. We had to go over the other side of Chatellerault the other day and wending our way back we encountered a number of pale lavender fields. So we stopped to take photos and I identified the crop as lupins. We've never seen lupins being grown here before. Most years I spot a number of fields of fava beans (field beans, broad beans) and last year for the first time I saw crops of peas and soy beans (Chris Luck had some interesting things to say about soy bean cultivation in France recently on his blog). Further east, around Issoudun, lentils are widely grown. These lupins appear to be White Lupin Lupinus albus graecus, also known as Field Lupin. White lupins have a spring and a winter form so I imagine that explains why they are flowering in April (ie they are the winter form, sown to overwinter and flower in the spring, like canola). This isn't a traditional pulse in central France, but I've seen them for sale in the supermarket in the North African section. There is a significant Portuguese population in the area too, and they appreciate White Lupin, so I suspect this crop is for human consumption, not animal feed. 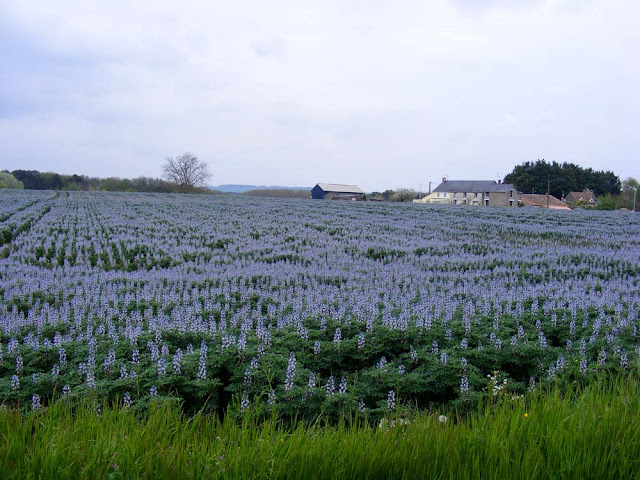 Lupins should thrive here because there is already a local species, Narrow-leaved Lupin Lupinus angustifolius, now very rare in the wild (its beautiful royal blue flowers can be seen on the roadside opposite the entrance to LeClerc at Ville aux Dames in the summer). Lupins like the sandy soil that occurs in pockets in the river valleys. 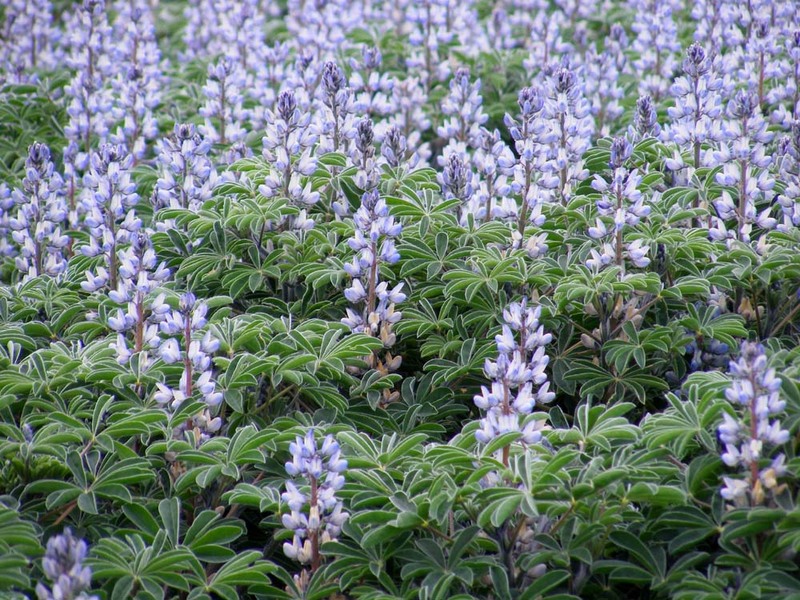 Ironically, Narrow-leaved Lupin has been developed as a crop in Australia and 85% of the world's production of this species is in Western Australia. Situated between the River Loire and the forest, Amboise is a veritable pantry for hirondines (that's swallows, martins, and by popular convention swifts, even though they are not strictly related). The swallows have been back for over a month now, and the swifts and martins for a couple of weeks. It's time to make sure their summer breeding season is a success. 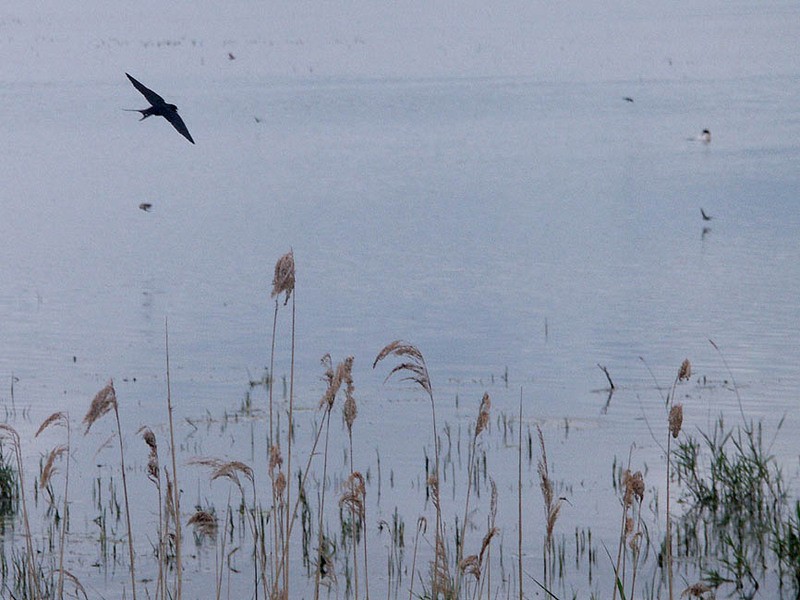 A Barn Swallow feeding over an étang. Amboise suits hirondines, which is a lucky break for them. Their populations are declining, but there is a group based in Amboise who are dedicated to protecting them. Anybody who walks through the town and looks up will see that hirondines love Amboise. You will also see the little mud nests of the martins clinging to the limestone of the old buildings and, in fine weather, there will be the charming sight of baby birds chirping on the wires, waiting to be fed by their parents. 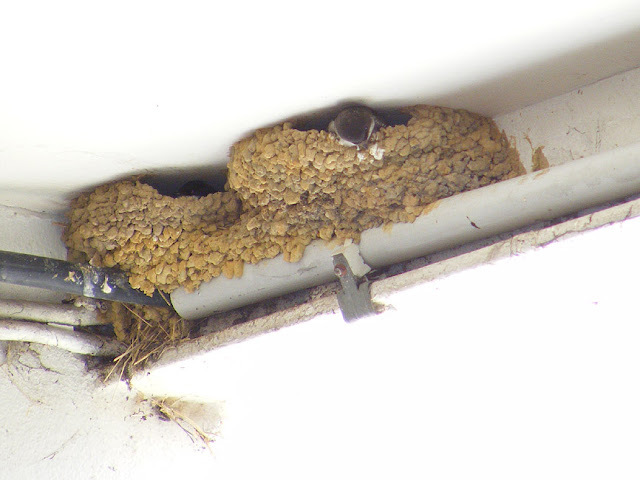 Baby House Martins in the nest. The populations of migratory birds is in free fall, despite their protected status. But Amboise is incredibly lucky to attract them year after year. "This town has an extraordinary living heritage. This is related to topography", explains Gismonde Gauthier-Berdon, a member of the Ligue pour protection des oiseaux (LPO) in the local paper. 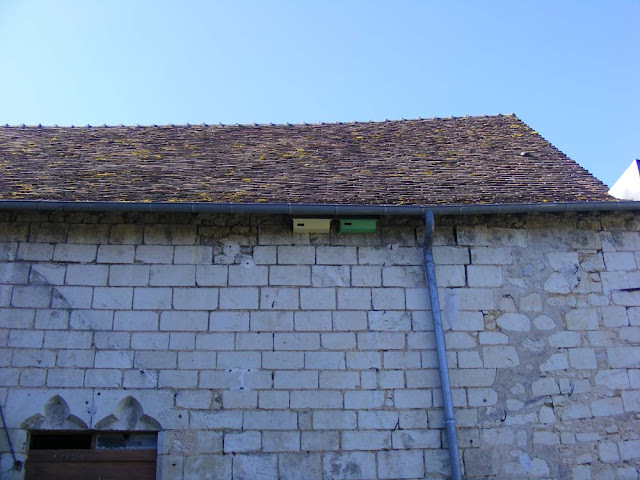 "Amboise, built between the Loire and the forest, is a pantry for the swallows: they find here not only insects that they feast on, but also the rather loamy earth to make their nests, which stick to the limestone." But there's the flip side: property owners continue to destroy the nests, which is against the law. Gismonde was shocked last year, when she came upon a scene of destruction in Quai De Gaulle: "I was going to the market, and then I saw all over the ground, on the footpath -- nests, chicks... I did a double take." 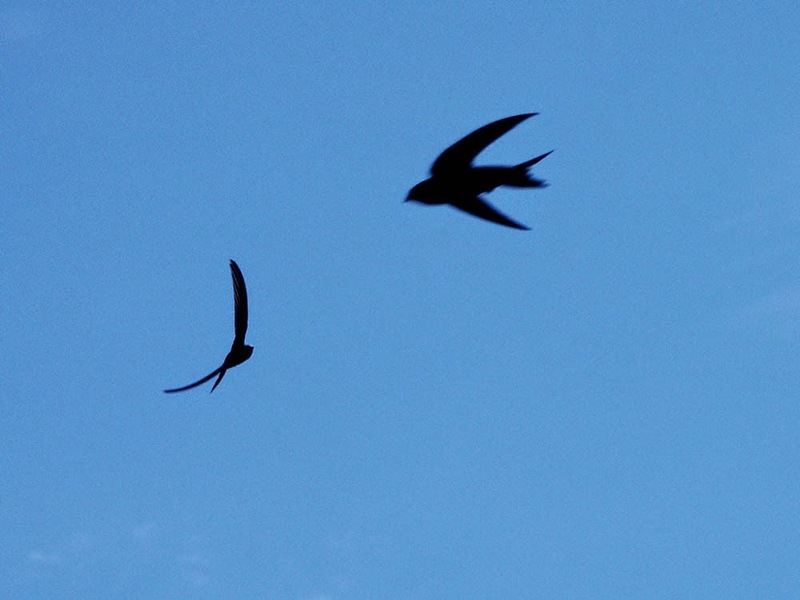 Swifts zooming around the sky. This outrage has led to the creation of a group of volunteers affiliated with the LPO, who have been preparing for the return of the migrators, who began to arrive in March. "We want above all to educate. Explain the need to protect swallows and swifts, who are like natural insecticides. We are not bothered by mosquitoes in Amboise." The volunteers intend to install anti-dropping boards and nest boxes on private properties. "We must make pragmatic actions which are seen." You don't have to live in Amboise to help conserve hirondines. 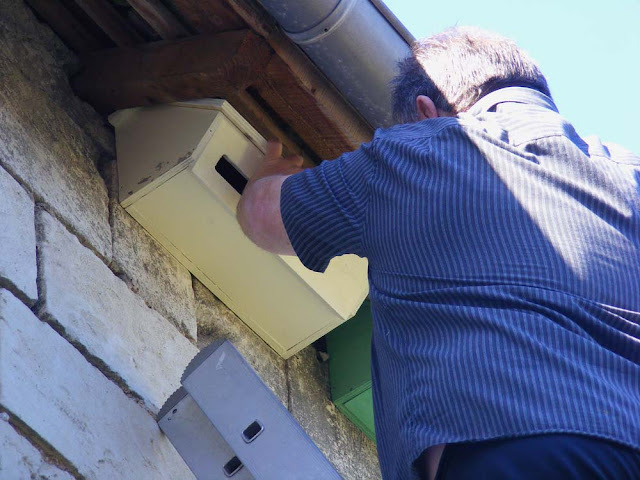 I have taken two swift nest boxes and installed them under the eaves of our barn. Contact Carolyn Knowlman (in English or French) if you want to get involved or know more. So what's a ZNIEFF (pronounced 'znuhff', as though you've just coughed or sneezed or something)? ZNIEFF is of course an acronym. It stands for Zones Naturelles d'Intérêt Ecologique Faunistique et Floristique (the equivalent of Sites of Special Scientific Interest in the UK). There is no equivalent Australian designation that I can think of. 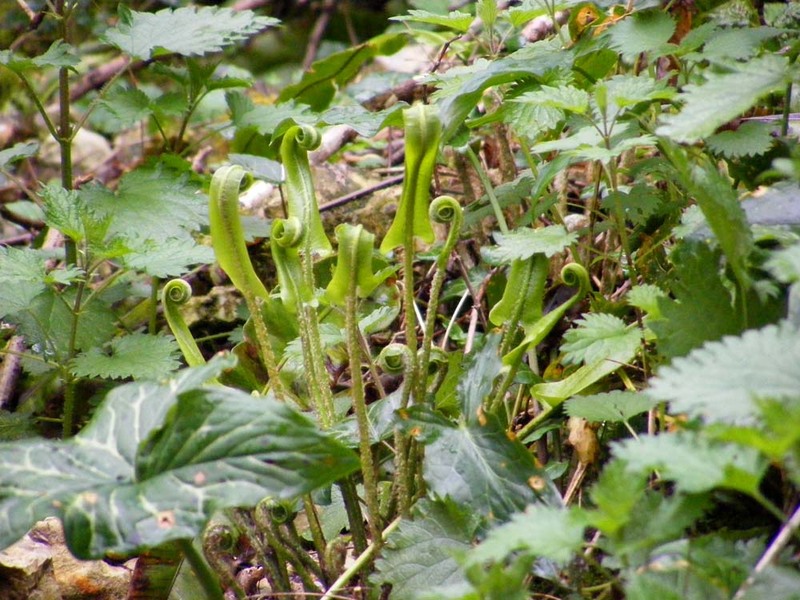 The Courtineau valley is rich in fern species. This one is Harts Tongue Asplenium scolopendrium (Fr. Scolopendre). 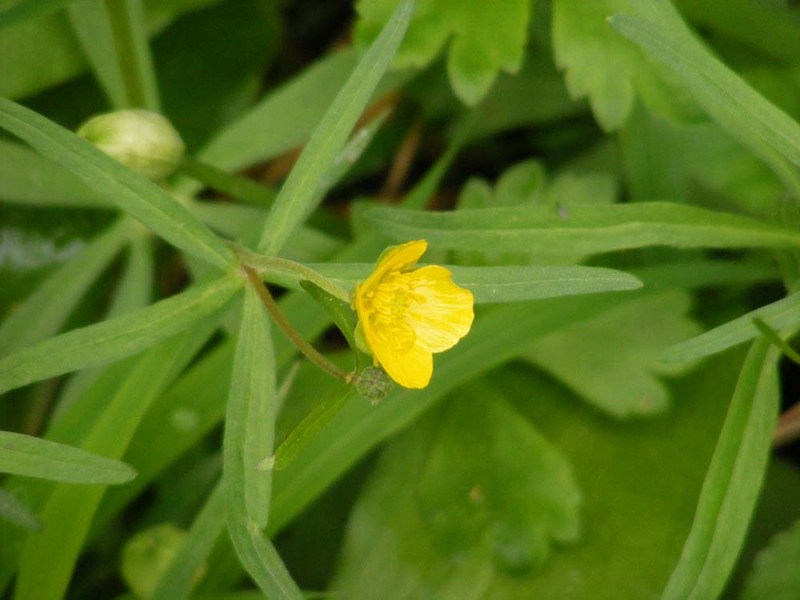 ZNIEFFs were introduced in 1982 and their focus is and always has been biodiversity surveying. The objective is to identify and describe sites with strong biodiversity and in a good state of preservation. 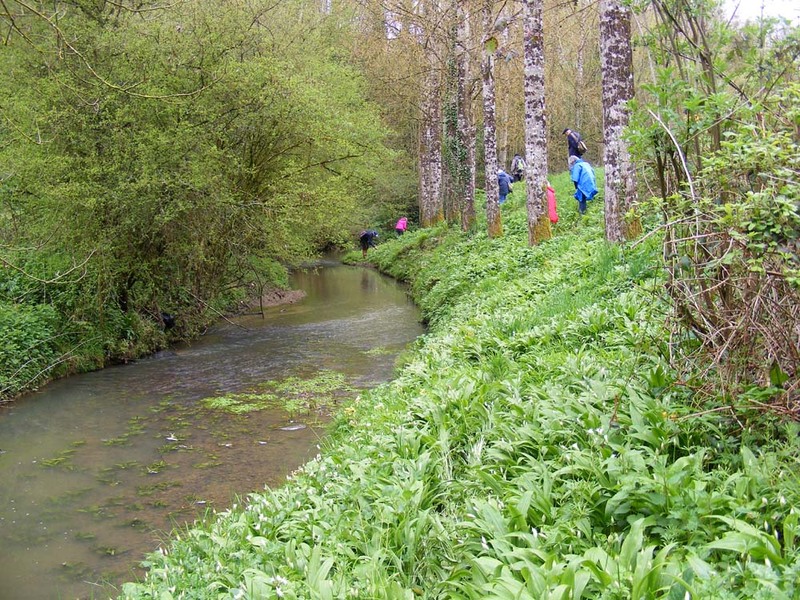 There are two categories: Type 1, which is a site with great biological or ecological interest; and Type 2, which is a site with rich natural assemblages that have not been altered much, offering the possibility of significant biodiversity. Since 2004 the aim has been to create a national atlas of species. You can tell this is a group of botanists. They are all looking at the ground. The ZNIEFF species inventories now form a major political tool in the sphere of nature conservation and protection. Any urban development, quarry or nature reserve project must take account of the relevant ZNIEFF lists. Land listed as a ZNIEFF may be developed so long as the natural environment is respected. The administration of the surveys is done by the Muséum National d'Histoire Naturelle. The actual work of surveying is done by over 2000 individuals belonging to local associations like mine, the Association de Botanique et de Mycologie de Sainte Maure de Touraine. On the back of the surveys a report for each site is created which influences its management. The Ministry of Ecology, Sustainable Development and Energy provides the (measly) funding. The point of surveying is to make sure that every site with a rare or protected species is listed as somewhere of scientific interest. botanist from getting a close look at a rarity. The ZNIEFF I went to help survey on Saturday 16 April is the Valley of the Courtineau, between Sainte Maure de Touraine and Saint Épain. It is one of the most prestigious natural sites in the Touraine, marshy, full of rare and protected plants, but not at all well known. Along the valley there are many gardens and a certain amount of construction. 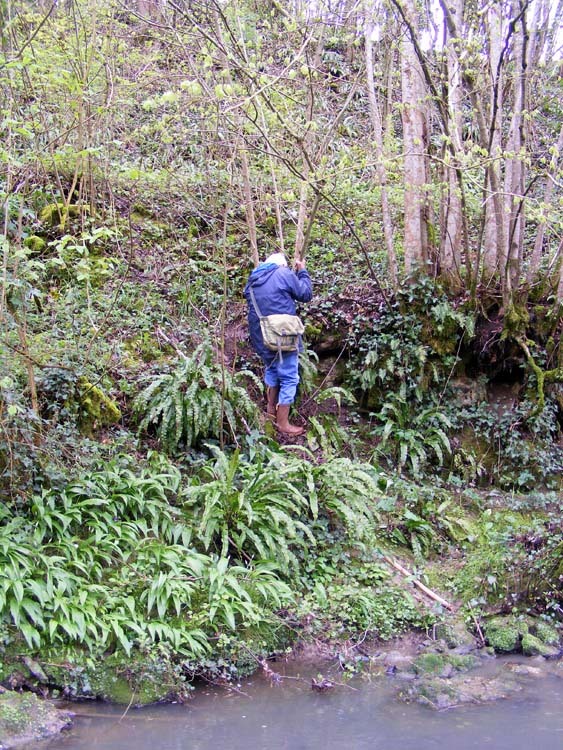 Little by little the landowners down the valley have been drawn into the project and talked into protecting their patch. As you can imagine this was no easy task. Our survey was ably led by the dynamic François Botté, who made the point that often it is roadsides that provide the most interest. He supports the idea of a new category of ZNIEFF, that of 'ecological corridor', which would include such things as the maintenance trails under high tension electricity lines. They would have to be monitored by groups like ours to see that they were being managed sensitively. François also explained why in France these protected sites are designated as 'zones'. He pointed out that in French the word 'zone' carries with it a nuance of 'protected', 'restricted' or even 'forbidden'. The word 'site' just isn't as strong. The Vallée de la Courtineau was originally assessed as a Type 1 ZNIEFF, but has been enlarged and upgraded to a Type 2 ZNIEFF, indicating that it is a site of national interest in terms of both natural and historic heritage. There is no longer any government finance to do the surveys. That stopped 2 or 3 years ago and there is 5000 euros of funding for the ZNIEFF programme for the whole of the département (which I suspect pays for a part time admin person). Greater Spearwort Ranunculus lingua (Fr. Grand douve). The D910 road cuts straight through the middle of the Vallée de la Courtineau ZNIEFF in a way that should never have been allowed. It creates a barrier that prevents animals crossing and this needs to be addressed. Because of this when plans for the new high speed train line from Tours to Bordeaux were announced, the route of the line was sent in a great loop around the Courtineau. Ironically this has resulted in more habitat damage than if they had just blasted their way straight through and I accompanied François last year on an outing to survey one of the little conservation areas compulsarily purchased from a farm along the line not far away, near Sepmes. 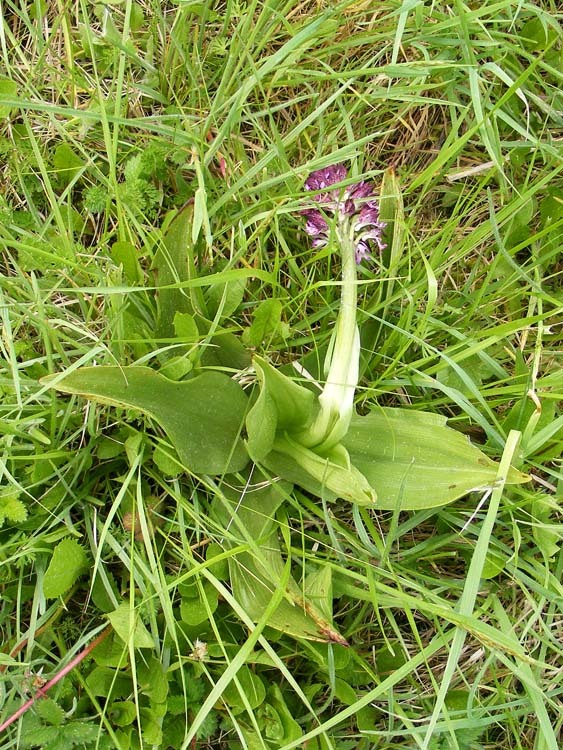 The two most significant habitats in the Vallée de la Courtineau are the limestone caves which shelter bats, and the orchid rich grasslands on the upper slopes. 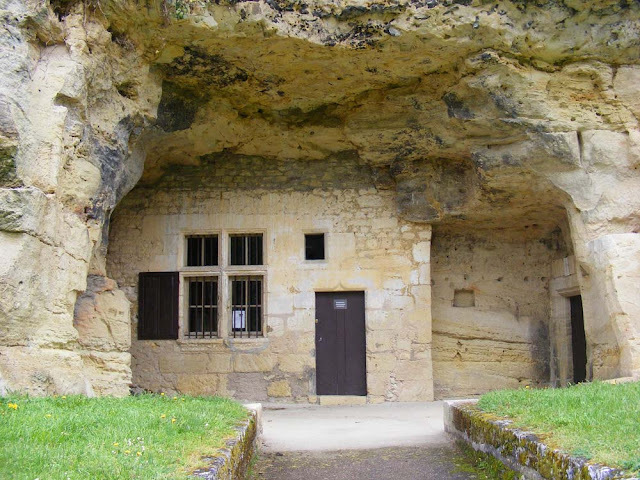 Happily, both the mayor of Sainte Maure de Touraine and the mayor of Saint Epain are both sympathetic to the idea of protecting the site and keen to encourage nature tourism. Keel-fruited Cornsalad Valerianella locusta f. carinata (Fr. Doucette carénée). The Courtineau river arises from a spring near Sainte Catherine de Fierbois and runs almost straight down to the river Manse, cutting a ravine through the soft limestone geology. This means the valley sides drain quickly and on the south side are hot and dry, supporting a suite of Mediterranean plant species. On the north side the limestone slopes are less steep, and remain wetter and cooler, supporting montane species. This combination means a remarkably diverse and rich flora. 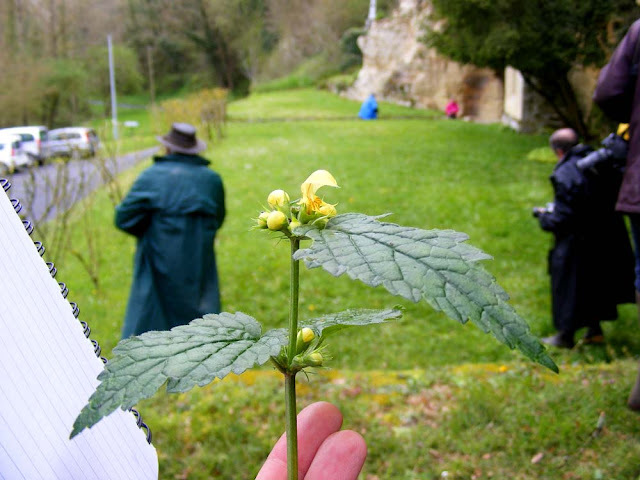 Yellow Archangel Lamium galeobdolon (Fr. Lamier jaune). The plateau the river runs through is impermeable clay and flint. The layer underneath is yellow tuffeau from the Late Turonien, not very high quality and not used for building. Loam, clay and flint is slowly sliding down the cliffs into the valley bottom. The tops of the cliffs are dominated by Downy Oak Quercus pubescens. These higher sections are very calcareous and well drained so areas of Besom Heath Erica scoparia are rare but significant. In the small side valleys, on the mid slopes the dominant trees are Lindens Tilia spp and Sycamores/Maples Acer spp. Down in the base of the valley it is wet and cool. Update: Here is a link to André's photos of the day: Les Botanistes dans la Vallée de la Courtineau 16 avril 2016. And here are Louisette's photos: Sortie Botanique dans la Vallée de la Courtineau à St Epain 16 avril 2016. You'll see pictures of me in both sets of photos. A la cuisine hier: A hybrid macaroni (actually penne) and cauliflower cheese, with some of our now dwindling supply of cheddar. Making the sauce with a mixture of stock and milk makes the dish a touch less rich but more savoury. Cuban style savoury mince with onion, tomato, cumin, bay leaf, olives and red pepper, served with rice. There is no 'Mondays in Milan / Les lundis en Lombardie' post today because today is Anzac Day in Australia. This is a memorial day when our war dead are remembered. displayed in the Musée de l'Armée in les Invalides in Paris. On Thursday I was talking to a truck driver at a winery. When he found out I was Australian he told me he had been to Australia in his youth and worked as a fisherman. He was also keen that I understood that in his eyes anyone from a country whose troops fought for France was a friend of his. 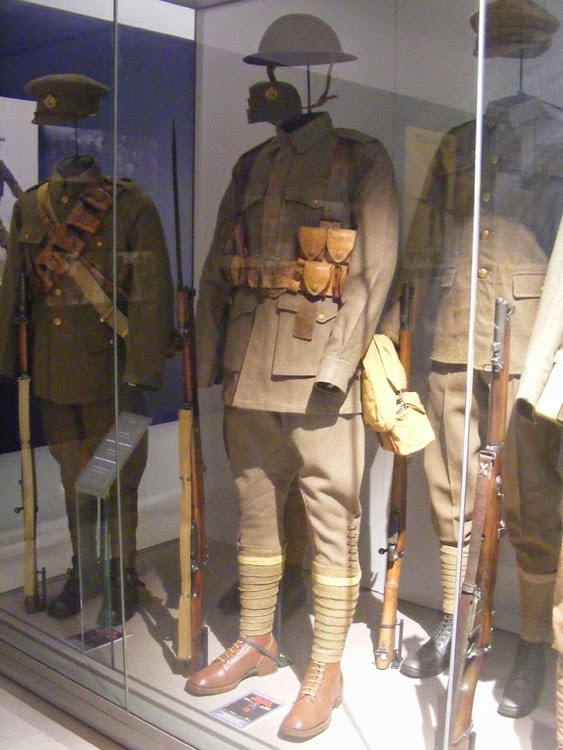 You can read our other Anzac Day posts here, where you can learn how to make delicious Anzac biscuits or read the sad stories of my Great Uncle Eric, made prisoner by the Japanese, or Simon's Great Uncle William, who died at Gallipoli. We should also not forget that this is the remembrance day for the many French citizens deported to the forced labour and death camps in Germany during the Second World War. A la cuisine hier: Creamy scrambled eggs, served on Laurence's soft ciabatta. My father and his Toyota Landcruiser in 2009. In 1949 Australia began a great hydro-electric project called the Snowy Mountains Hydro Electric Scheme. It needed tough all terrain vehicles for its hundreds of workers and engineers to get in and out. Initially they used Landrovers and Dodges, but neither company could reliably supply the vehicles needed, and the vehicles themselves didn't always cope with the terrain. In 1959 one of the engineering companies involved approached Toyota. This was quite a controversial thing to do at the time as there was a lot of anti-Japanese prejudice in Australia due to the treatment of Australian and other Commonwealth prisoners of war by Japan in the Second World War. 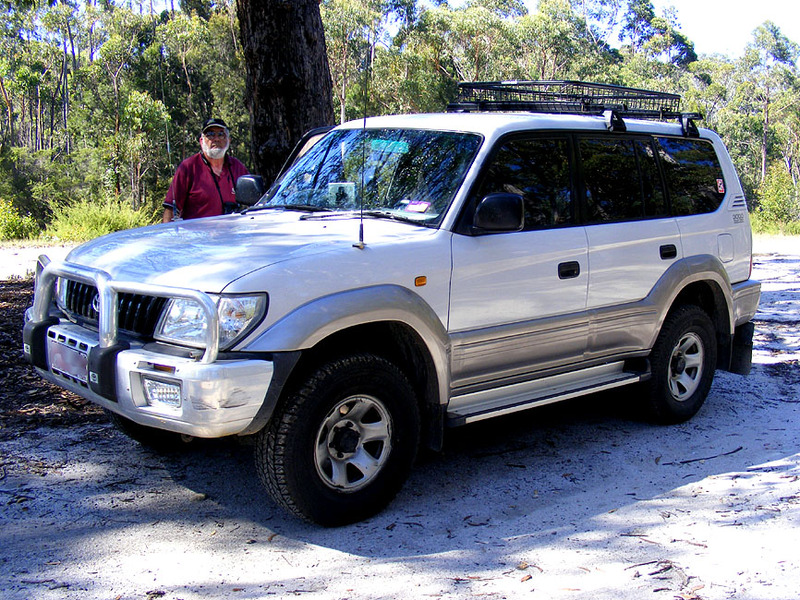 But Japan was very keen to enter the Australian market and Toyota's Landcruiser was just the vehicle to make the breakthrough for them. Within 12 months the Cruiser as it was generally referred to had become a legend, with a reputation for total reliability in even the roughest most isolated terrain. Toyota had cracked it, and soon there was hardly a farmer, mining engineer, geologist or outback traveller who didn't own one. Nowadays tour operators, the police, fire brigade and the army all use Cruisers, as well as city dwellers who never go off-road at all. Our posts on Sundays have an Australian theme. You can read more of them here. Back in July 2013 my Sunday 13 post mentioned the hydro-electric scheme and the Polish workers who came to Australia after the war to work on it. We did a quick u-ie and stopped to take this photo. It is a baguette dispensing machine supplied by Les Délices d'Estrées bakery from Chateauneuf. The baguettes cost €1 each. Trained by the Compagnons de Tour de France (Master Bakers Guild) Alexandre Bernardeau took over the bakery in 2007. His typical neighbourhood bakery employs 6 people, 4 of whom are apprentices. The baguette tradition is his star product. 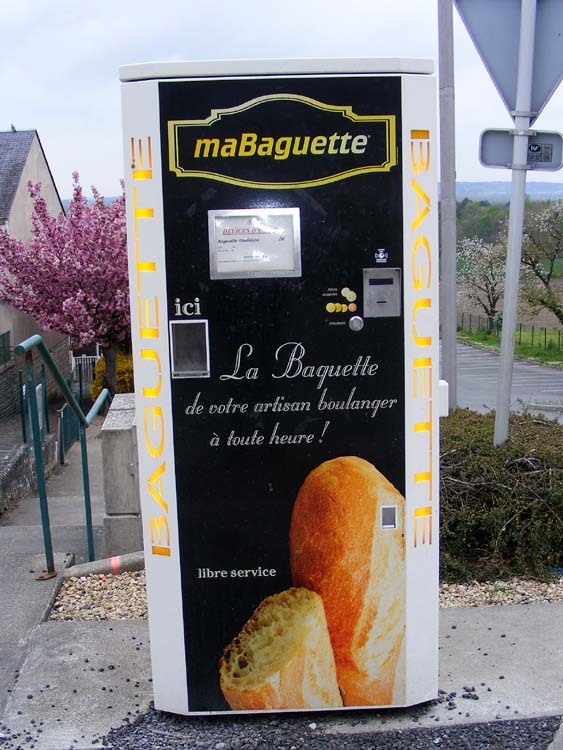 When he realised there was no longer a baker in the nearby community of Colombiers he installed this dispensing machine. It is restocked several times a day so the bread is always fresh. He has invested in an electric vehicle to make the journey to and from the machine. A baguette tradition is an artisanal product with ingredients and method of production strictly defined by law. It is not an industrial product, but made fresh and from scratch on a daily basis. The ingredients are wheat flour, salt, water and a little bakers yeast. No 'bread improvers' or other additions are allowed (except a very small percentage of soy or lentil flour). A poolish (pre-ferment) is made, then the dough is given minimal kneading (just enough to incorporate the remaining flour and water). The dough is set in a proving chamber to rise. It is knocked back and allowed to rise four times before being divided and shaped by hand into baguettes. Then it is laid out on undulating linen sheets known as toiles de couches to rise before baking on the floor of the oven. Frozen dough may not be used. Today is the Fete de la St Georges in Preuilly. We are hoping it will be more bustling today than the past few years, and that the weather holds. The forecast isn't brilliant, but it hasn't been brilliant for the past week and nothing of note has happened apart from a sharp rainstorm yesterday afternoon. 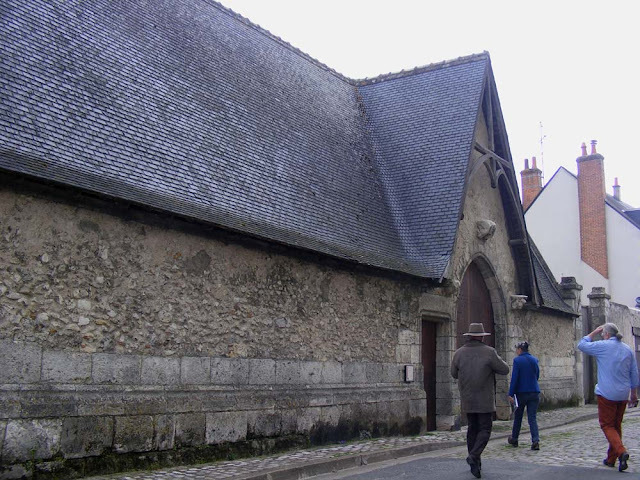 This building in the Vienne area of Blois (on the southern side of the river Loire) is an ossuary (Fr. aître). We had hoped to visit it with our friends Rosemary and Jean Michel, but it is only open on the Journées du Patrimoine these days. Rosemary tried to get the key from the tourist office, but couldn't find anyone who could help. Inside it is a galleried building similar to a cloister (and apparently many people mistake it for a cloister). The column capitals on the south gallery have the figures of a danse macabre carved into them, so I was disappointed not to get a look. The building was constructed between 1516 and 1520 and used as a cemetery until 1807, when it was converted into the laundry for the General Hospital. Finally in 1933 the building was handed over to the town of Blois and became a museum for medieval masonry and architectural sculpture. In particular it houses the salvaged masonry and sculpture from the houses in Blois that were destroyed at the beginning of the Second World War. 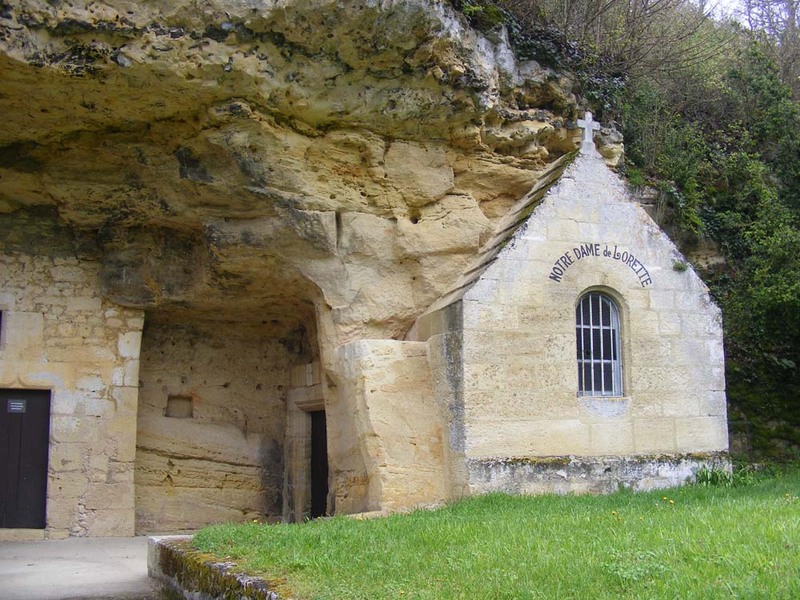 It is one of only four cemeteries of this kind remaining in France. Showing the backs of the flowers. You can see they are shaped more like an apron than a pocket. 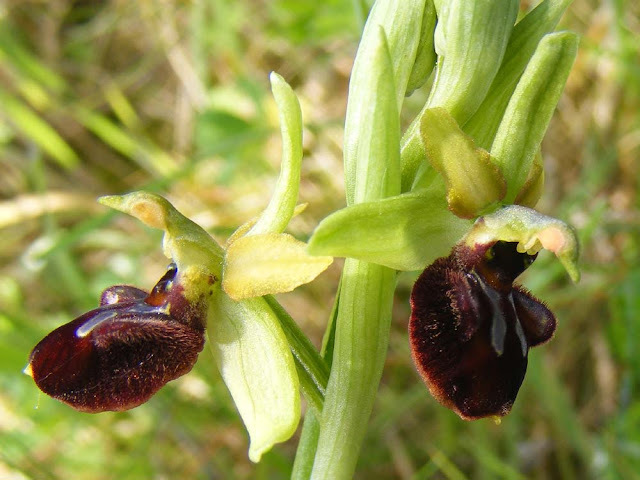 The Early Spider Orchids (Fr. 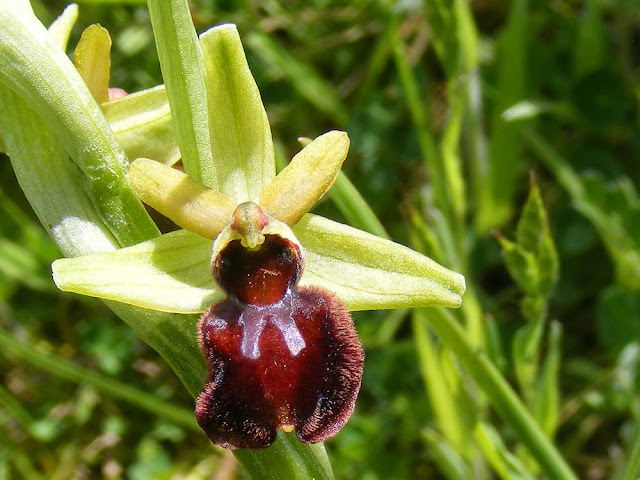 Ophrys araingées) are flowering in the orchard, so here is some pictures. These are a particularly rich burgundy colour on the labellum (the lower petal), with no yellow border. This one shows the shiny lilac 'landing strip' to give the bee pollinators somewhere to aim for. On Monday Célestine was due to go back to the mechanic to investigate various noises and clunks. When we came out of the house to head off I noticed a small Hedgehog (Fr. hérisson) skulking in the driveway. It tried to pretend it wasn't there and I took some photos of it. Then I put on some gloves and moved it to behind the barn so it was at no risk of being run over. It was a bit frightened of us but didn't seem to be injured so I left it to sort itself out. It poked about under the steps of the barn then in the vegetation. 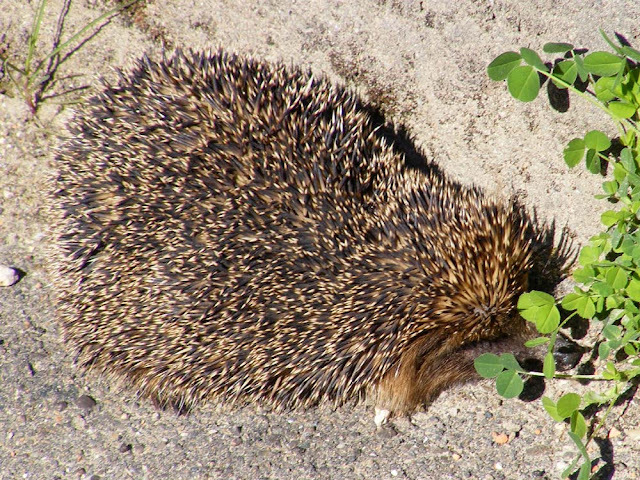 By the time we returned from dropping Célestine off at the mechanic's the hedgehog had disappeared. 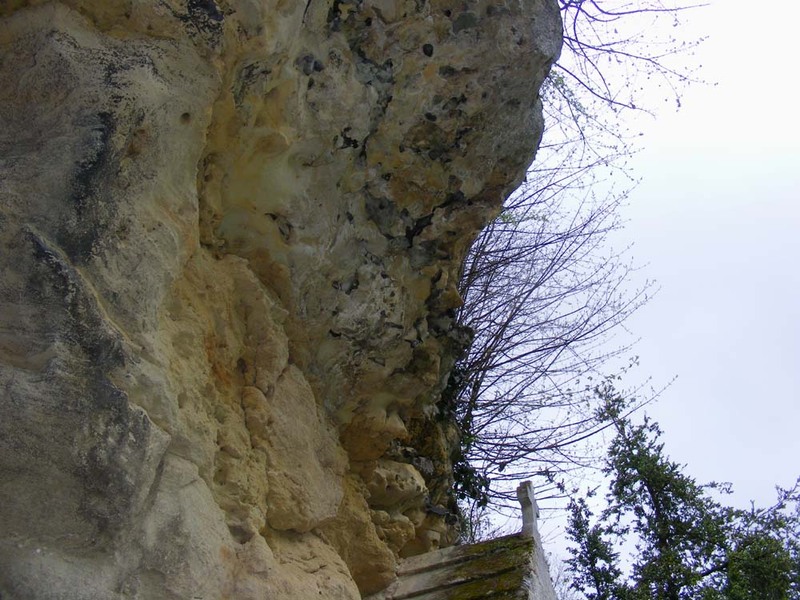 Notre-Dame de Lorette is a troglodyte chapel in the valley of the Courtineau river near Saint Épain. It is privately owned. The chapel is carved into the rock and under the patronage of Our Lady of Loreto. This 15th century oratory has its origins shrouded in mystery, as evidenced by the crescent carved into the door lintel. Inside there are apparently interesting sculptures in the rock too, but the door was locked and I couldn't see anything through the windows. I missed a central arch which is decorated with a carved cross on its entire length and two arched arcades that adorn the wall. There is also a representation of the Holy Trinity, with God as a bearded old man, his Son symbolised as a tomb, and the Holy Spirit shown as a bird with outstretched wings, all overlooked by two kneeling angels. Then there is a short stone frieze and a carved coat of arms. Unfortunately I didn't get to see any of it. According to tradition, Joan of Arc sheltered from the rain here as she traveled from Sainte-Catherine-de-Fierbois to Chinon on 6 March 1429. Each year, this is a place of pilgrimage on the first Sunday in October. The chapel is adjoined by a dwelling created at the same time, cut into the rock and lit by a mullioned window and a door with a decorated lintel. It comprises two rooms, one of which was heated by a fireplace cut into the rock. The crescent arms are found carved into the mantelpiece here too. Not far from the chapel is a fountain dedicated to Saint Mark which was once a destination for many pilgrims. 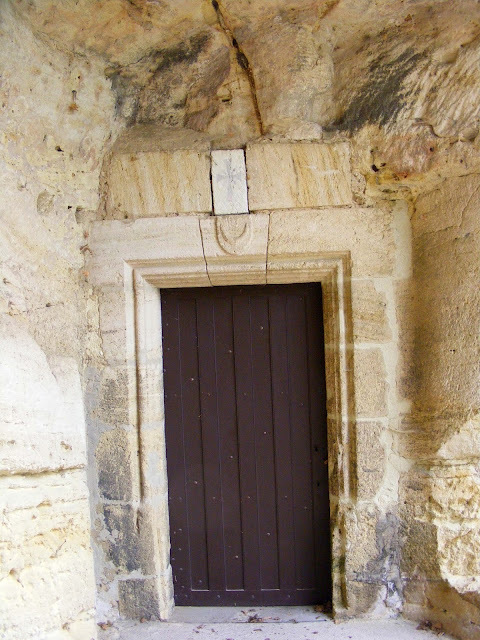 The door to the chapel, with its mysterious crescent coat of arms. It is listed as a Historic Monument. Many people believe this place was sacred long before the chapel was constructed or the area Christianised. A substantial seam of flint runs through the stone the chapel is carved from. It is very easy to find, just north of Sainte Maure de Touraine, and turn west off the D910, signposted Vallée de la Courtineau. It is a kilometre or two down a quiet country road that meanders along in the valley of the river and there is a carpark in front of the chapel. It makes a good base for a walk. I hinted at this after we returned from Milan, but it never quite made it to the blog. When we were in Milan my mate Alex and I ventured past the city limits to Arese, a journey not to be undertaken lighty if you don't have a car. (It takes an hour, even using a taxi for the last 15km). The Museo Storico Alfa Romeo is a combination museum, reference collection and shrine to all things Alfa, from aero engines to Formula 1 via family cars and road racers. 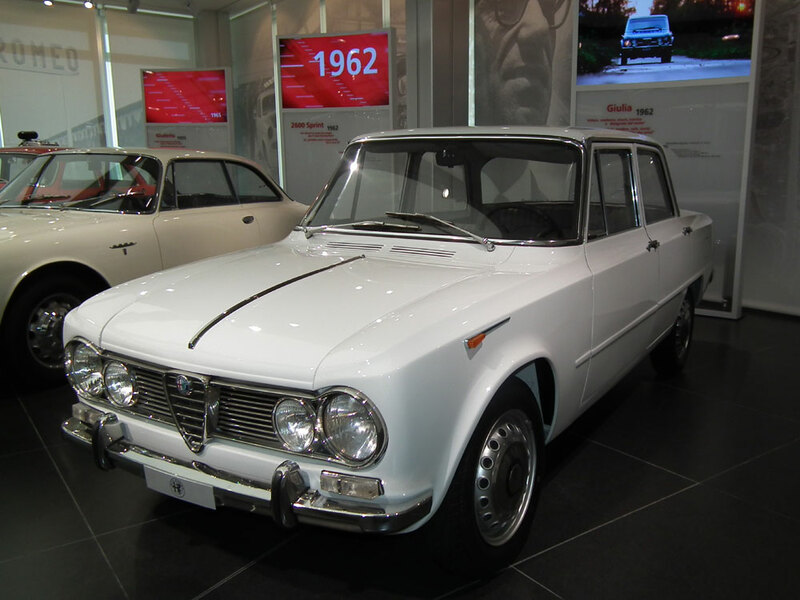 It is on the site of the factory Alfa Romeo opened in the 1960s, and although cars are no longer made there it is still the site of the head office. There are many many cars there, from the obscure to the bizarre, and some that I even remember from seeing on the roads. Of course, visiting a place like this with a self admitted rev-head whose father had a string of Alfas when they were living in Italy in the 60's and early 70's really added to the day: stories of long summer voyages from Milan to Rome in pre-autostrada times were really evocative. Did I say bizarre? 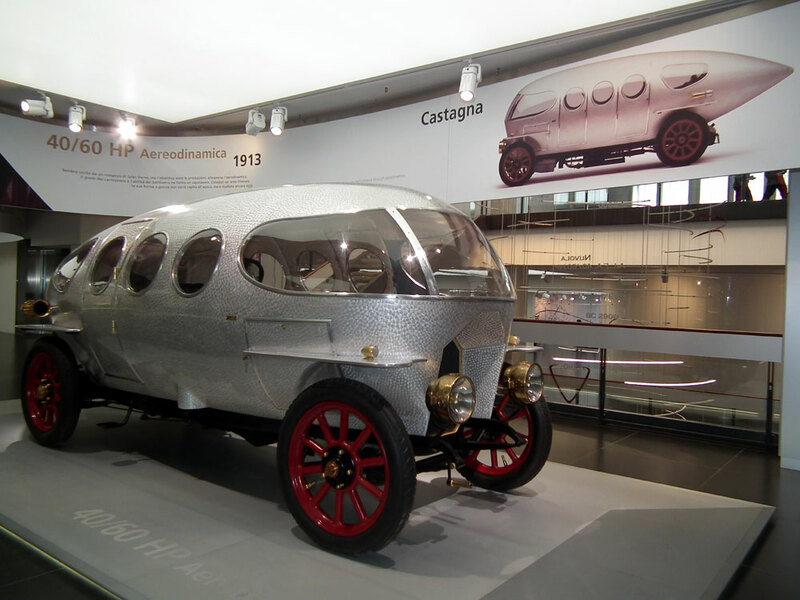 This 1913 car has the engine inside the cabin. 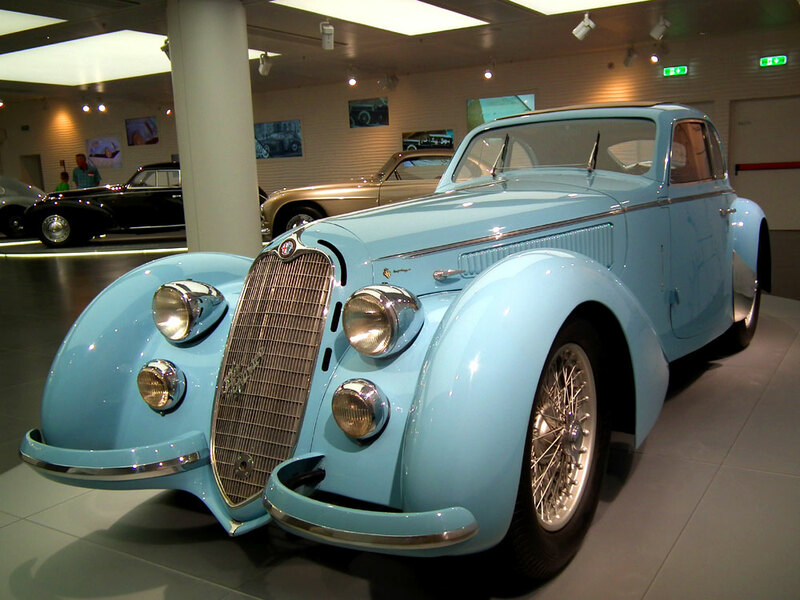 The museum is spread over 5 floors, with the cars arranged by theme - pre world war 2, post war family cars, exotica, road racers of all periods, experimental cars, and modern racing cars. Most of 'em rather quite nice, even if, as we have already seen, not always practical. We spent a very interesting couple of hours at the museum, and I have to say it is beautifully presented. If there was only a way to get there by public transport when the temperature is nudging 40C. Did you see what I did there? 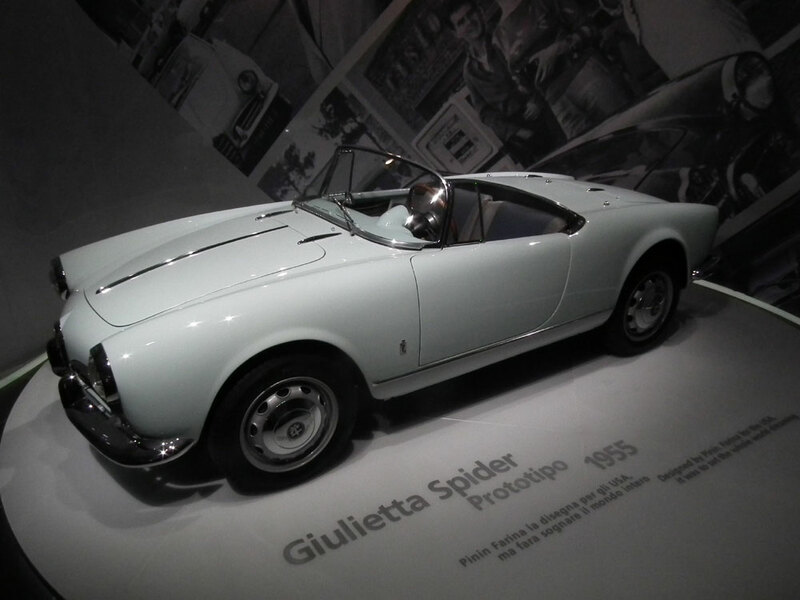 A whole post about Alfa Romeo and not a red car in sight! Next time, maybe. 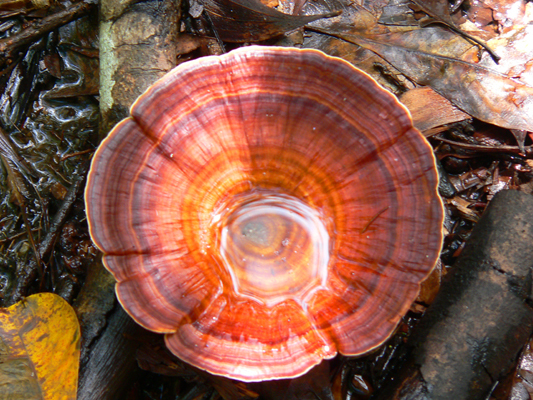 This striking banded fungus was found trackside on one of the Fogg Dam walks. I've no idea what species it is. Our post on Sundays has an Australian theme. You can see our other Australian posts here. How the Heck is the Postman Supposed to Reach That? 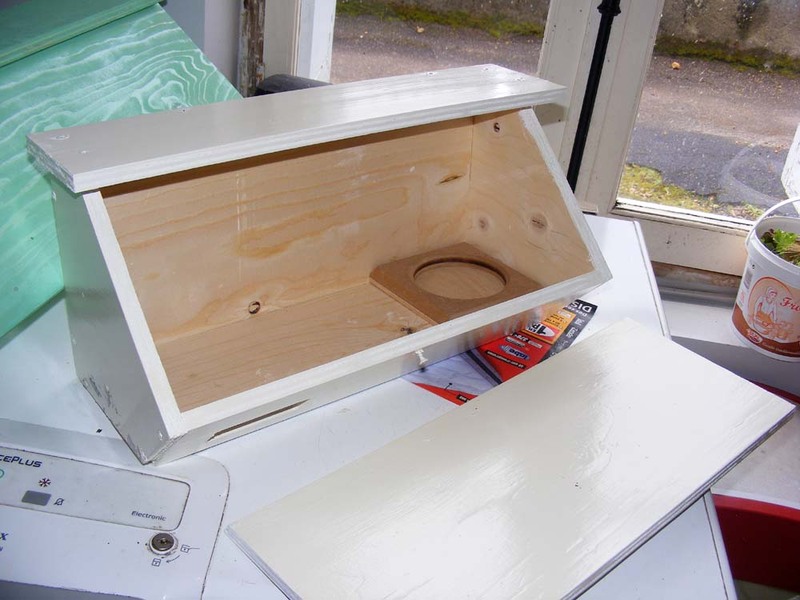 One of the nest boxes, showing the interior with its glued in ring to create a base for the nest. The next challenge was to find someone with a long enough ladder who could fix them to the back of our barn, just under the eaves. This is north facing and just to the left of the downpipe was deemed ideal for swifts by Carolyn. I emailed everyone I could think of who might have a ladder suitable for working at about 8 - 10 metres off the ground. 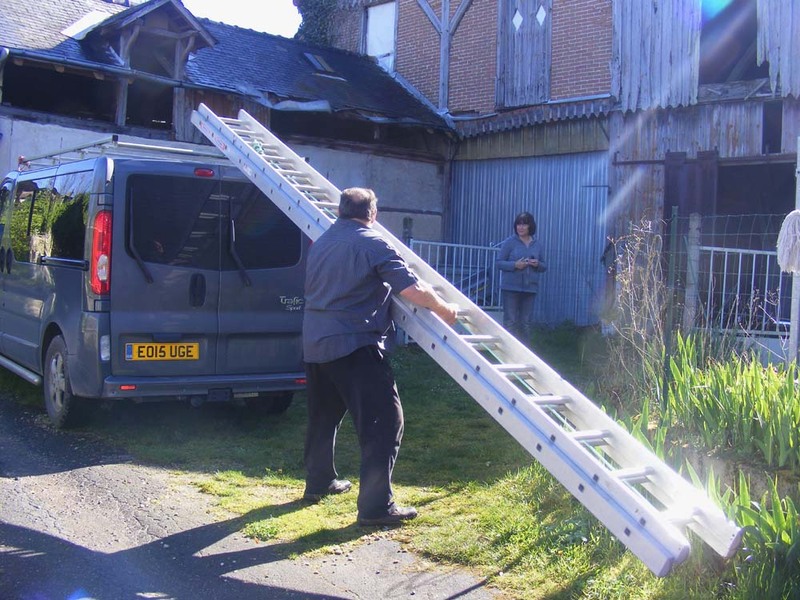 Several French friends suggested I contact the fire brigade or a local roofer, but luckily Dennis got in touch to say he had a suitable ladder and could do it. On Tuesday he and wife Angela came over and the job was done. Longtime readers may remember Den and Ang as the lovely people who delurked as blog readers several years ago in order to offer to bring our bargain priced range hood over from England. Dennis arrives with his longest ladder. Turned out his second longest ladder would have done. 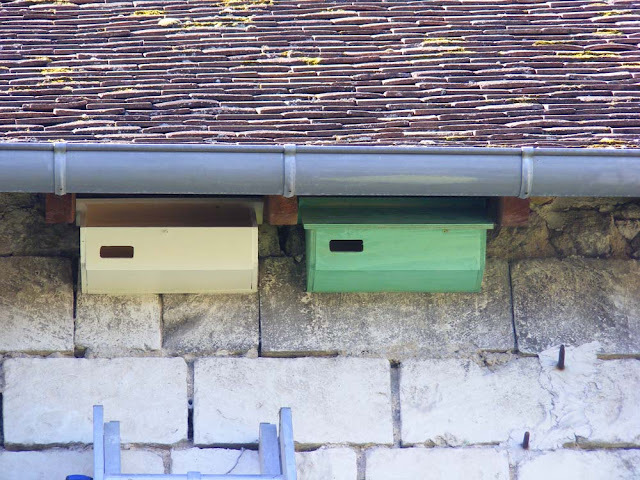 Carolyn has convinced the Amboise town hall to install nest boxes on various buildings, and her friends and acquaintances are all encouraged to do so too. Her best result so far has been some friends in Amboise who put up some boxes last year. They were occupied by swifts within three weeks of going up. Now the house has 28 nest boxes under the eaves, ready for this year's arrivals. I picked the boxes up from Carolyn on the day I went up to Vouvray to look at the wild tulips. I showed them to Charles at Chateau Gaudrelle as he is busy renovating an old farmhouse in Esvres and has already instructed his roofers to be careful not to disturb the House Martin nests. He queried whether the nest boxes should be painted, worried that the paint might off-gas which would be bad for the birds, or they might just not like it. Carolyn reassured us that modern paint is much less noxious than in the past and the swift conservation groups now take the view that it is better to prolong the life of the nest boxes by painting them on the outside. They are not painted inside. My two nest boxes installed on the back of the barn. They look rather like improbably high letter boxes. She also advised that someone like Charles, who is still renovating, should ideally go for swift nest bricks which are built into the wall or leaving gaps under the eaves so they can access the roof space. Swift bricks look like a concrete block with an entry hole and are just incorporated into the wall like an ordinary brick or block. If it is too late for a nest brick, the nest boxes like I have installed are a good alternative. They need to be placed as high as possible, with a clear flight path for approach, not on a south facing wall. Ideally a recording of swifts calling should be played as loudly and as often as possible from mid-May onwards to attract the swifts to your nest boxes. A hour long CD can be purchased for very little from Swift Conservation. They fit very discreetly between the rafters under the eaves. Nest boxes themselves are quite easy to make and there are lots of instructions available on the internet. This version is the one Carolyn recommends. The idea is that they are fixed to the wall through the back, but Dennis suggests that the back be extended beyond the sides so that they can be fixed without having to fiddle about in the limited space inside the box under the eaves. The opening faces downwards so that the less aerially adept sparrows are discouraged from taking possession of the boxes before the swifts even arrive. The nest boxes are becoming essential for the swifts. Their breeding success is starting to be affected by the loss of nesting spaces in buildings as people renovate and block holes up. Questions? I will be interviewing Laurence, one of our local bakers, on Tuesday, for a future blog post. If there is anything you would like me to ask her, let me know, either in the comments section below or by emailing me via my profile on the right hand side bar. For years there have been lots of complaints about how inexplicably inadequate the train service between Tours and Loches is. Henry James made some rather exasperated comments about it a hundred and forty three years ago. There are especially complaints about the 6.20 am train, which is the one many commuters use. The journey of 47 km from Loches to Tours takes 61 minutes at an average speed of 46 kilometres per hour. 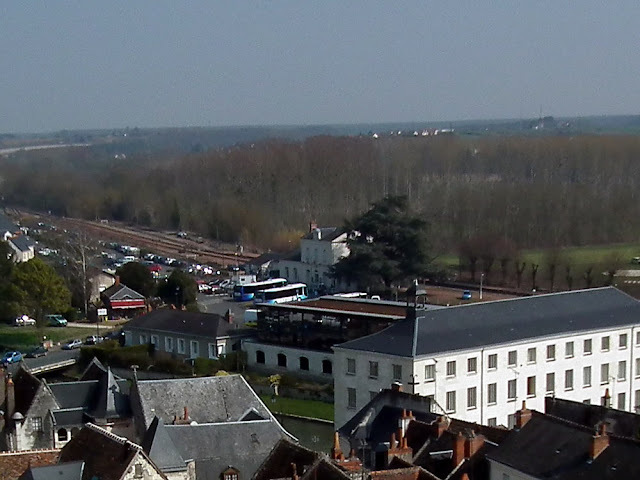 The commuters from Loches complain that the train is often late. They describe contacting their local, departmental, regional and national authorities to complain as being about as effective as throwing a message in a bottle into the sea. No one ever responds. The commuters get alerts by text message to their mobile phones when the train is going to be late. The reasons given range from 'equipment unavailable' to 'late leaving the depot'. It might be 5 minutes, it might be half an hour. Often the train is delayed because of a freight train sitting in Reignac sur Indre station. When that happens commuters sometimes resort to calling taxis, but often by the time they arrive the train has moved off again. They could choose to wait for the next scheduled service, which in fact is a rail replacement bus. But it is always full. The commuters joke that in Loches it isn't the early bird who catches the worm. (The French expression is l'avenir n'appartient pas à ceux qui se lèvent tôt, which translates as 'the future belongs to those who rise early'.) Luckily most people's employers understand. 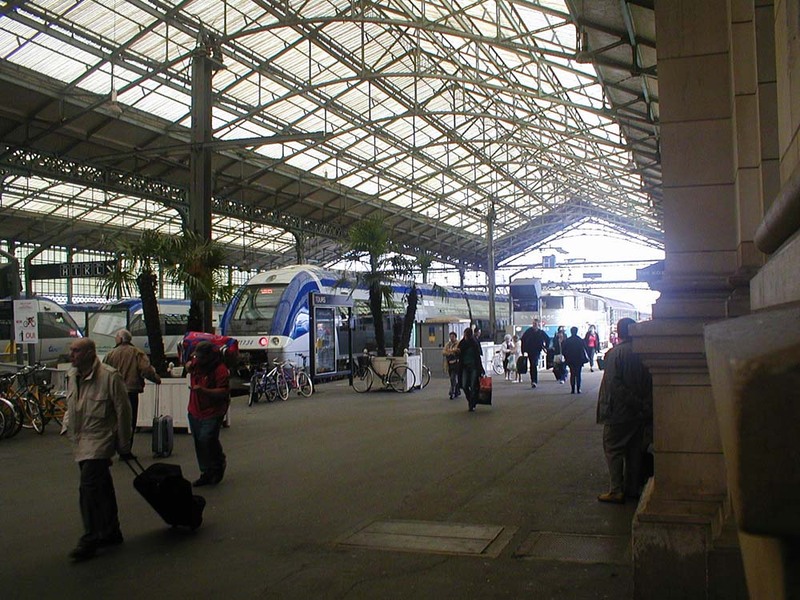 The interior of Tours station. The commuters have considered car sharing as an alternative but decided against it. The train fare is part subsidised by their employers so that it costs each commuter €40 a month (or a euro per trajectory). To travel any other way would be more expensive. Loches station, with train replacement buses parked outside. 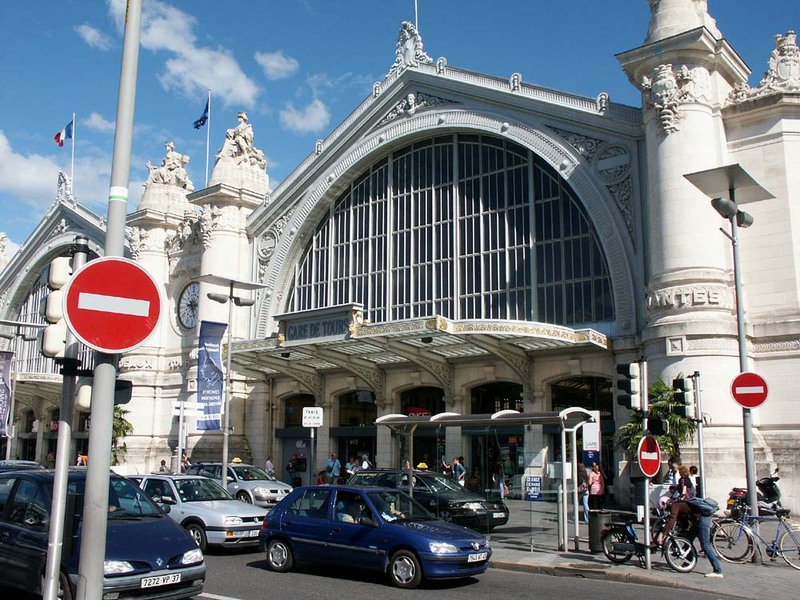 The commuters want to have a meeting in Loches one evening, with the regional authority. Despite the announcement to modernise the line, regular passengers doubt there is any political will to invest in it long term. The modernisation is enshrined in the Regional Plan for 2015 - 2020 and is set to cost 40 million euros. That's 19 million from the national government, 19 million from the Region and 2 million from SNCF (the French National Railway Company). Every month there are 59 000 passenger journeys on this line, which is a single track, non-electrified route built in 1878. And it's not just the passengers who are disgruntled. The railway union CGT wrote to the Regional Vice President for Transport in March this year. "For several years, the Tours / Loches line has suffered from numerous shortcomings causing the growing dissatisfaction of the users but also frustration within the railway, who are not given the means to ensure a quality public service." They say the upgrades scheduled for 2018 do not compensate in any way for the current problems. They also want a meeting, with the local railway bosses and Tours-Loches line Development Committee. The last meeting between these groups was in 2013. To read our other posts about Loches (which are mostly glowing paeans of praise about this lovely historic town) click here. After the recent newspaper articles about the inadequacies of this railway line the Nouvelle République ran an article claiming that a local retired mechanic has come forward and on Friday demonstrated his 'mini-bus-on-rails' solution. According to the article he has been working on it in his shed for a while, intending it for the long closed Loches-Chateauroux line, but it occurred to him that his idea could also work for Loches-Tours. The date of publication is significant. The First Time I Saw..
A Greenway to Replace the Railway?